Don’t forget about the road salt! If you’re online reading an article about car care, you obviously care enough about your car to take that extra step. However, you should already know that the best way to take care of your car is to do so constantly. You shouldn’t only be periodically concerned with major things such as seasonal changes. Pay attention to the everything including tire pressure, fluid levels and overall engine health. Constantly monitor your car’s condition and if you think something’s wrong, take it to the shop and get it checked out if you can’t figure it out for yourself. Make sure you always have the instruments you need in order to evaluate your car’s condition as well as the tools to fix any issues if possible. Things like tire gauges, tire irons, a jack, a spare or at least a donut, a wrench, extra wiper fluid, extra anti-freeze, and whatever else you can think of. You should also have a membership with a roadside assistance program like AAA, just in case something happens while your out on the road where you can’t fix your car yourself and need a hand or the car towed. With all that in mind, you should also be prepared for specific things such as winter conditions. When you ship your car to Alaska, these are the conditions your car will be facing the majority of the time. You’ll want to make sure that your car is completely “winterized.” Now, not every part of Alaska is a constant winter storm with feet of snow. However, heavier winter weather generally tends to be the norm in the slight majority of the state. 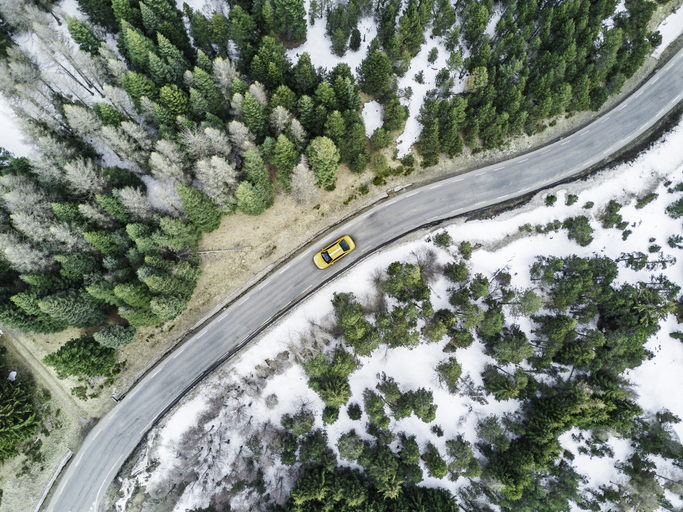 One of the first things you should do is to make sure that you get some new snow tires with good treads on them, so you can be sure that you’re ready for any snowy and icy roads. You will also want to make sure that they are new and not used. Used tires can be really worn and the treads won’t be as effective. In a perfect world, used tire dealers would be honest and only sell used tires that were in good enough condition for some considerably mileage. Sadly, this often isn’t the case. Some people will even sell bald tires to unsuspecting customers. New tires are, by far, your best bet. You’ll also want to make sure that you have spare windshield wipers in your car. During cold snowy weather, windshield wipers can end up sticking to your windshield if you don’t angle them off your windshield earlier in the day (always try to do this in cold weather climates as a precaution). Unfortunately, many people don’t pay enough attention to the forecast or will forget to take this precaution. Then when they try and move their wipers to clear snow off of their vehicle or when they turn their wipers on, they will snap. This can render your car undriveable if you’re still experiencing snow at the time it occurs. This is why having an extra pair of wipers and knowing how to put them on can be invaluable in a place like Alaska. As mentioned earlier, you’ll want to make sure that you have your car’s fluid filled as well as extra in your trunk just in case you end up needing it. The two most important fluids in terms of weather in a wintery climate to keep an eye on are windshield wiper fluid and anti-freeze. Both of these are crucial to keeping your car drivable in an Alaskan climate. You’ll also want to be sure that you have a good snow and ice scraper in your car. When you aren’t in your car for an extended period of time and the snow is coming down, it will obviously accumulate all over your car. When this happens, you’ll need to clear it off before you start driving. Driving with snow all over your car is not only dangerous, it’s illegal! You also don’t want to get stuck clearing off your car with your hands, it’s much more difficult and much colder. Finally, before you even ship your vehicle to Alaska, get your car checked out at the shop. You’ll need to be sure that your car is obviously in good general shape, but you’ll also want to be sure that your heat and defrosters are working fine. These are critically important while you’re actually driving to keeping visibility at a maximum. The biggest winter road condition people don’t account for when driving their car in Alaska is the salt of the road from the plows as well as the increased amounts of small rocks and pebbles from the road that occur because of the winter weather. These things can cause small scratches and dings on your car. For the most part, you can’t prevent this but, if you get your car waxed before you ship it to Alaska, this could possibly help lessen the potential for these small scratches and dings occurring. All of this might seem like a little much to some of you, but this high level of preparation is worth it for the piece of mind alone. It’s obviously also worth it because odds are that you will run into some sort of weather-related issue with your car while you’re in Alaska. Once you’ve made all these preparations, all you’ll need to worry about is getting your car to Alaska. With the auto shipping experts at Alaska Car Transport, you won’t have to “worry” about that either. Get a free quote today or call us at (907) 331-3100!